J. Kaye of J. Kaye's Book Blog tagged me for this really fun meme: Find your 5th photo file folder, then the 5th photo in that file folder. Then pass the meme to 5 people. 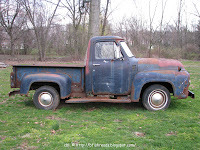 In the late 1960s or early 1970s my husband was driving this truck as his primary vehicle! At some point he abandoned it on his parents' property. Last spring he towed it out from the woods and asked me to photograph it before he either sold it or junked it. I'm going to tag people that I know for sure have cameras and post photos. 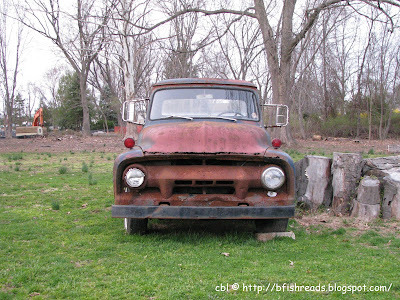 I love old trucks! Before kids, I drove a '68 Ford. I doubt I'll ever go back to driving them again. One tends to get use to power steering...lol! Oh, the turck looks so cute. It almost has a look of sad puppy. Amazing what one can find in their photo files. Somehow, I can see this old guy joining the cast of "Cars" as a cartoon. The truck was originally a blue color. The red is the rust. Poor thing. I've been at Sea World all day on a field trip, so I have been out of commission! I will take the tag, and post hopefully tomorrow! I'm scared at what picture I'm going to find! I love that truck! What great photos! What a classic truck. My boys got a kick out out seeing it. It's almost a Bella truck! My mother's uncle had one similar to this on my great-grandmother's property when I was a kid. Loved to play in it!